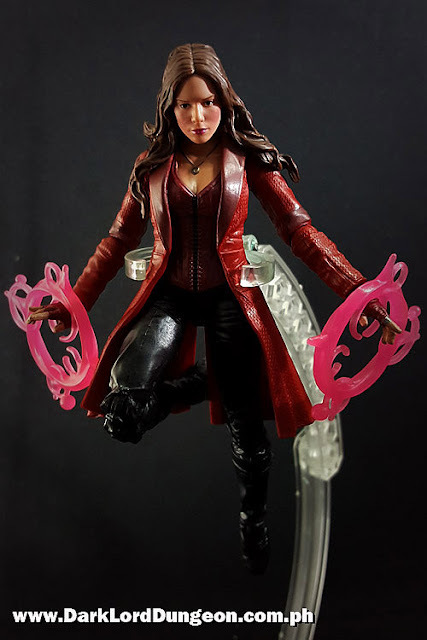 Presenting Wanda Maximoff, the Scarlet Witch from the Marvel Legends Captain America Civil War toyline. To the uninitiated, this is the outfit that the Scarlet Witch wore when Captain America's team went toe-to-toe against Iron Man's team in the airport in Germany where she displayed an ability for short flight, telekinetic strength of incredible proportions, and a penchant for throwing German made cars. This is not the outfit that she is seen wearing at the end of Avengers - Age of Ultron. For our thoughts on Captain America Civil-War, click here. Personally we'd love to have had her Age of Ultron "Schoolgirl" look. We thought that it was quite... fetching... and it suited Elizabeth Olsen. We're certainly looking forward to her return in the Avengers and if her short incarceration on the Raft would have any effects on her mental heath. Presenting the Blurr and the Headmaster Hyperfire from the Transformers Titans Return toyline. If our memory serves us correctly: Blurr was never originally a Headmaster. He's a Targetmaster - which means his gun transformed into a mini-Autobot. However it was because Blurr lost a race (We know right? How'd that happen?) to Hot Rod (Yes the guy who got Optimus Prime killed) while Daniel Witwicky was driving or partnered with Hot Rod, that Brainstorm started espousing the benefits of having a "pilot" merged with the Autobots. For more about Brainstorm and his Headmaster Arcana, click here. Daniel would later be injured in combat and to save his life, Brainstorm turned Arcee's head into a cockpit/exosuit and Daniel became the first Headmaster - also creating in the process, the first Transgender Transformer - and ending the crush that many of us had on Arcee. For more about Arcee before she became a Headmaster, click here. Presenting Wolverine from the Marvel Legends X-Men series Juggernaut BAF toyline. We believe that the last time Logan wore the tan and brown uniform was when the reconstituted X-Men tussled with Magneto all the way back with Jim Lee's run with the X-Men circa 1991. He's been wearing variants of the Yellow and Blue uniform since then. For a look at the mode modern Wolverine costume, click here. 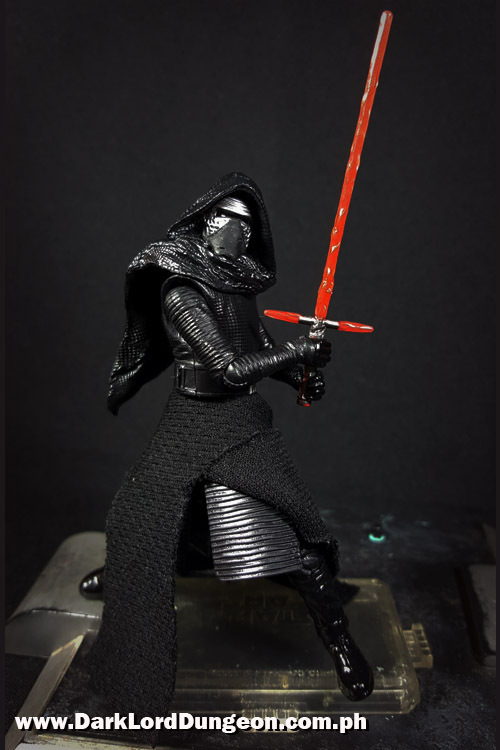 Presenting Kylo Ren from the Walmart Exclusive Black Series Star Wars Episode VII toyline. To the uninitiated, this is the Kylo Ren 3.75" Black Series that comes with far more articulation than the regular Hasbro 5POA toys. This is not the 6" Black Series figure that we reviewed before Episode VII came out. 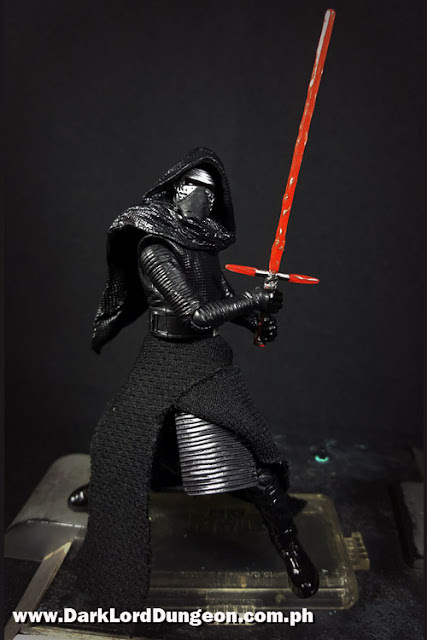 For our review of the 6" Black Series Kylo Ren, click here. Now that we've seen Episode VII and we're almost half-way to Episode VIII, we know that the internet is still pretty divided about the efficacy of that cross-guard. We know that the cross-guard doesn't work to protect Kylo. It's actually an offensive weapon for when lightsaber duelists get really up-close. Personally we believe that the cross-guard is still more of a liability than a benefit. So much so that if you ever check out Ray Park wielding the cross-guard lightsaber, that - despite the fact that he can deftly play with it - he keeps it a healthy distance away from his body. 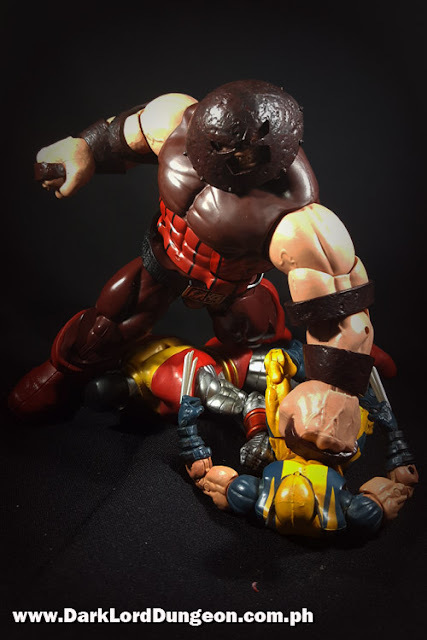 Presenting the Havok from the Marvel Legends X-Men Juggernaut BAF series. To the uninitiated, this is Alexander "Alex" Summers AKA Havok, the younger brother of Scott Summers AKA Cyclops. Singer's X-Men movies reversed their ages. 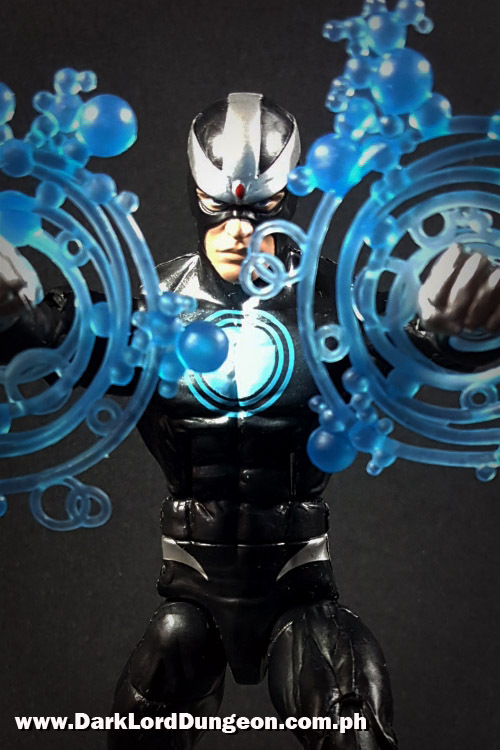 For more about Cyclops, click here. Waaaay back in the 80s, we remember an Alex Summers who was pretty much useless because he was so afraid that his plasma blasts would maim or kill anyone he used them against - which is true, Havok fires plasma (Ironically Sunfire and hey! The Human Torch - have no such qualms), not concussive force (Which is what his brother Cyclops fires). As a cosmic powered entity (Again like his brother Cyclops), suffice to say he's pretty powerful. So Marvel had to gloss over that period and allow him the ability to keep hitting people with his plasma blasts. 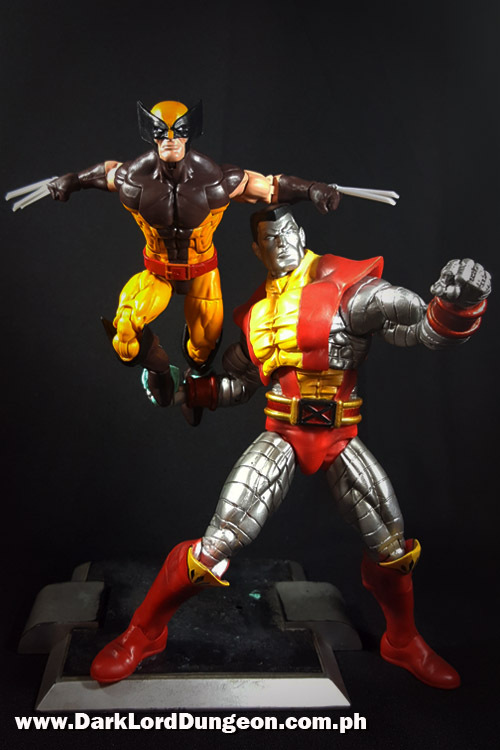 Presenting the X-Man Rogue from the Marvel Legends X-Men Juggernaut BAF series. To the uninitiated, Anna Marie, the mutant also known as Rogue, is currently a member of Captain America's Avengers Unity Squad along with Deadpool. A power thief, she currently has the powers and psyche of Simon Williams, Wonder-Man, making her nigh invulnerable, strong enough to take on Thor, and pretty much immortal. But that's the current comic book Rogue. 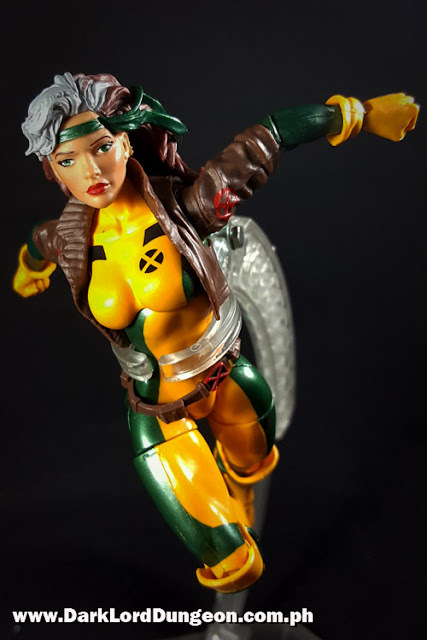 In this guise, Rogue had the powers of the pre-Binary Carol Danvers, so: flight, invulnerability, super-strength and a "7th sense" which allowed her to predict the movements of her enemies (Allowing her to actually predict where a teleporter like Nightcrawler would next appear). Presenting the Pocket War Commander from Machine Boy, AKA a KO of the Transformers Generations Optimus Prime. When Hasbro released the Transformers Generations Optimus Prime, we severely chastised it for being a great concept in such a puny form. For our original review of the Transformers Generations Optimus Prime - and for our subsequent Reprolabes upgrade , click here. Anyway we said that we would love to see a larger version of it, and someone in China must have heard us because.... here he is: A slightly larger Optimus Prime that's not quite as puny, but.... is still rather puny. But because this particular Optimus Prime does not have any Autobot logos, this is, for legal purposes, NOT Optimus Prime. This is the Pocket War Commander from some rag-tag company called Machine Boy - the company also responsible for creating a Knock-off of Bruticus, and a plethora of other Transformers. Presenting the Build an Action Figure (BAF) Juggernaut from the 2016 Marvel Legends X-Men line. To the uninitiated, Cain Marko is NOT a mutant, though he has been both one of the most formidable opponents of the X-Men and a one time member of Xavier's merry band of mutants. The Juggernaut is powered by the Crimson Gem of Cyttorak - an other-dimensional being of immense power - a power which can be drawn upon by magic-users on Earth. The Crimson Gem of Cyttorak comes with an instruction manual of sorts: "Whosoever touches this gem shall be granted the power of the Crimson Gem of Cyttorak! Henceforth, you who read these words, shall become ... forevermore ... a human juggernaut!" The bearer becomes the avatar of Cyttorak who gets his high on destruction. As the Juggernaut, Cain Marko is a near immortal with the strength to shatter mountains, regeneration, and a mystical force-field that grants him invulnerability, particularly when he's in motion. He doesn't tire, and can survive without food, water, or oxygen. You might also want to check out the Juggerlossus. Click here if you do. 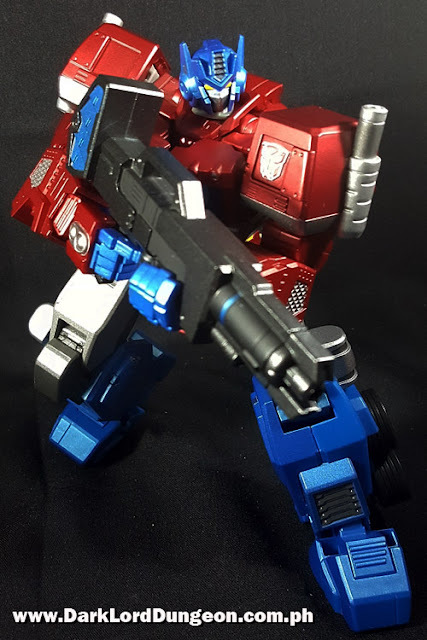 Presenting Optimus Prime, Hero of Steel from Ori Toy. A few months ago we were having an interesting conversation about Optimus Prime and 3rd party Transformers. 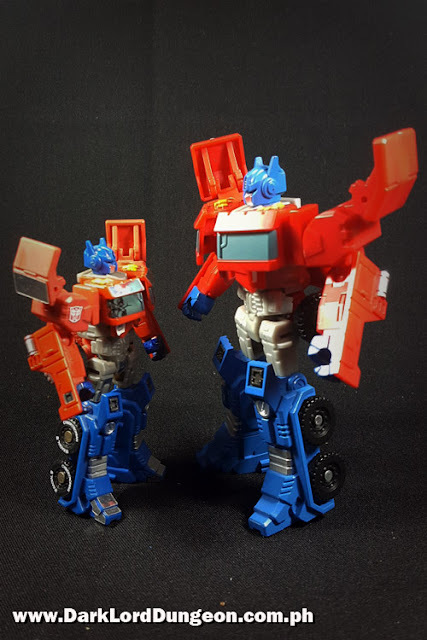 Check out some of the Optimus Primes were reviewed by clicking here. We were wondering just how in the world both Takara and Hasbro could allow 3rd party companies to get away with, - what would seem perfectly obvious to any casual observer - complete trademark rip offs of their products. Not that we're complaining - since we, too, gobble up the 3r party products like there's no tomorrow, but.... seriously? 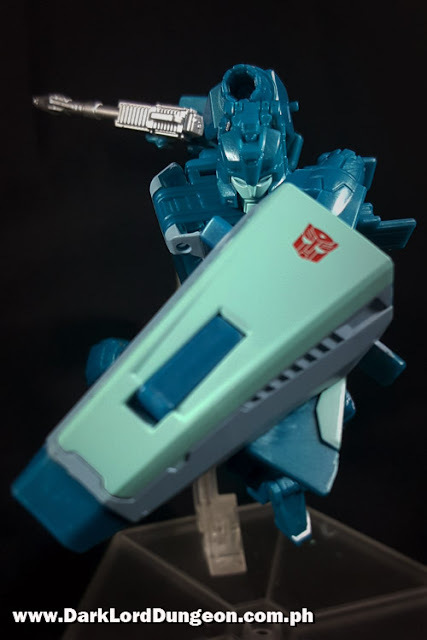 It turns out that all a 3rd party manufacturer has to do is remove the Autobot or Deception logos from their "products" (They can't call them Transformers) and they are considered distinct enough not to be copies of the Transformers owned by Hasbro and Takara. So we were wondering how Ori Toy got away with this because that Autobot logo on Optimus Prime's shoulder is not something we had to add on, and Ori Toy is using the name "Optimus Prime"
Presenting the "Merc with a Mouth", Wade Wilson, AKA Deadpool from the Marvel Legends X-Men Juggernaut BAF series. To the uninitiated, Deadpool is not a fan of International Women's Day, but was genetically altered by the Weapon X program so that he possesses a healing factor that is so strong he can survive a bullet up "Main Street" - and live to talk about it. Deadpool's healing factor is stronger than Wolverine's. Wade has shown the ability to survive full-on decapitations without the benefit of any external empowering force (Wolverine once regenerated completely - Adamantium and all - from a single drop of blood, but he was powered by a cosmic, reality manipulating crystal). For more about the Marvel Legends Wolverine, chick here. 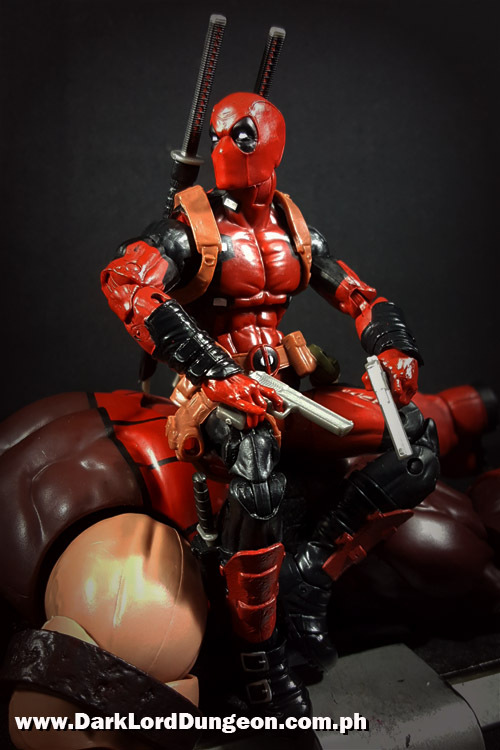 Which of course doesn't mean that Wade doesn't feel pain - so it really helps that Deadpool's mind is so messed up, he probably can't distinguish pain from pleasure. So yeah, he probably thinks he can take down the Juggernaut. 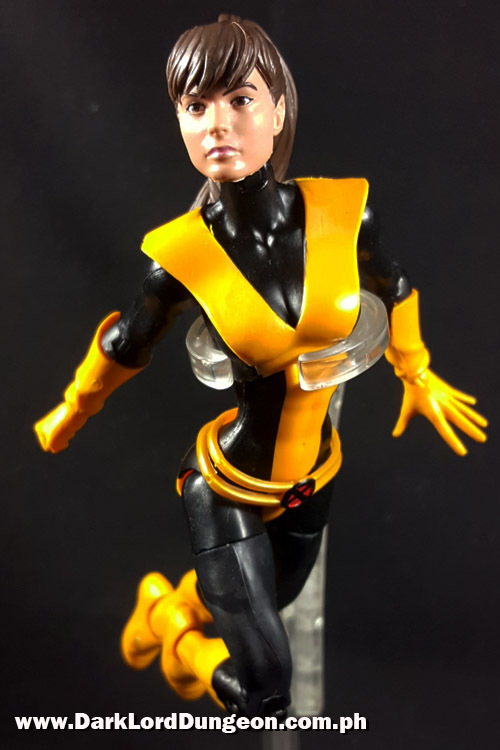 Presenting the X-Man Katherine "Kitty" Pryde AKA Shadowcat from the Marvel Legends X-Men line. Or Ariana Grande if she was a super-hero. To the uninitiated, and as of this writing, Kitty Pryde, formerly of the X-Men and currently a member of the Guardians of the Galaxy as the new Star-Lord. Also as of this writing we're not sure if she and Peter Quill will be getting back together and if she will be relinquishing the title of Star-Lord now that Peter is back with the Guardians. Anyway, this is Kitty Pryde as she last appeared as the leader/mentor of the time-displaced original-five X-Men and prior to her phasing powers being elevated to cosmic levels - allowing her to phase through anything and phase anything, phase through the multiverse and walk through space. But since the Black Vortex supposedly granted her god-like powers, this is probably just a taste of what she can do. Presenting a 2004 Defense Mech from the GI Joe Valor vs Venom toyline. There's something built into every guy's ego that says that if you are to enter the battlefield, you have to be the biggest, baddest motherfracker to walk into the warzone. For more about the GI Joe Steel Marauder, click here. 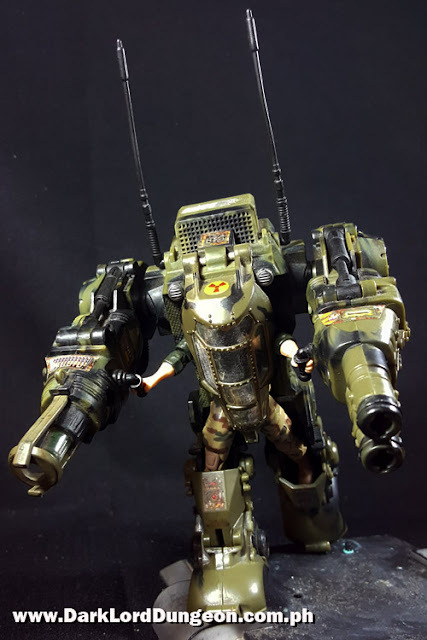 Though personally, I think that anybody strapping into a GI Joe Defense Mech should really be bothered by the "radioactive" symbol above the cockpit which suggests that this thing is probably powered by a mini-nuclear reactor (Akin to Battlemechs). That's not something you want to be close to in the event of reactor breach.